In yesterday’s homework for Dare We Call it Whitehousegate, the challenge was to identify the 2009 managing director of Tenko Management Pty Ltd. He was mentioned at ICAC (Independent Commission Against Corruption) on 2 May 2014. It was in connection with fundraising in the evidence of Karen McNamara, the Liberal member for the Federal seat of Dobell. It concerned the question of “off-books moneys” in Central Coast 2011 State election campaigns, in particular Wyong, The Entrance and Terrigal. McNamara was the campaign manager for Darren Webber, Liberal candidate for Wyong. It was alleged that $300,000 for the three seats had been directed through the Terrigal campaign. Our person of interest is Rodney Michael Bosman, son of former Member of the House of Representatives for St George, Leonard Bosman. 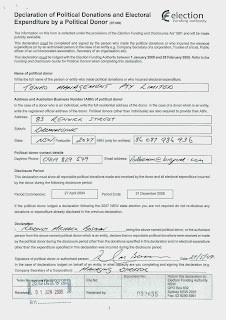 The page above is from Disclosure Details for Donor Tenko Management Pty Ltd for the Election Funding Authority. It details contributions of $2598 to Sam Danieli's 2008 Mayoral Campaign for Warringah. The party… appointed a ‘‘battleground director’’, Rod Bosman, who oversaw the Hunter and Central Coast. I spoke with Darren Webber [one of the 4 MLAs] who advised me it was coming through Terrigal. I also spoke with Rod Bosman who came in from Sydney to oversee the Hunter and Central Coast campaigns. [And what did Mr Bosman tell you?] ---That it was going through the Terrigal SEC. [So Mr Bosman was aware of this arrangement where this money was going through the Terrigal SEC?] ---Yes. Until recently Bosman worked for the NSW Liberal Party in Western Sydney. He was also a key campaigner for John Howard and John Alexander in the federal seat of Bennelong. On 23 November 2010 Tenko Management paid $1462 to the Wyong SEC campaign. 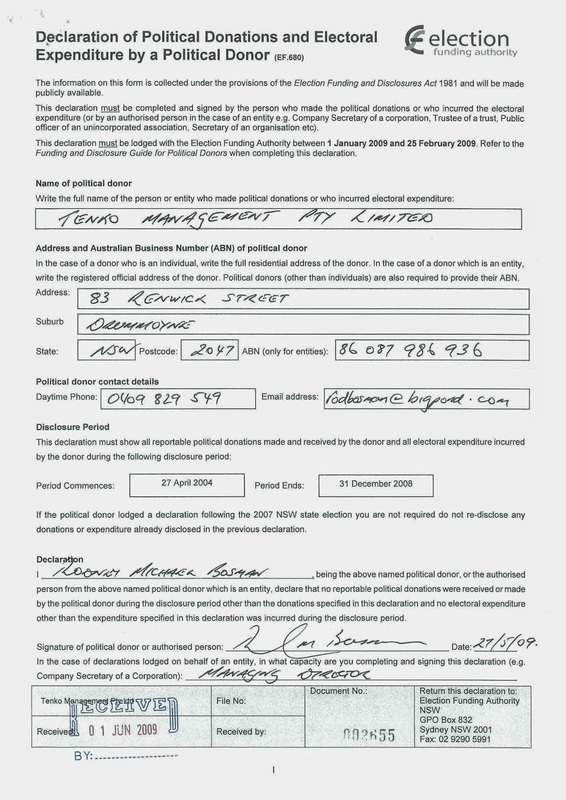 In 2004 Leighton Holdings listed among its donations/events the sum of $2500, for a ‘Meet the Shadow Cabinet Dinner’, paid to the Liberal Party of Australia – NSW Division c/- Rod Bosman. The PO Box was one that has been used by Tenko Management Pty Ltd in Drummoyne. It would be interesting to see Tenko’s company accounts to determine what sort of company it is and what other political payments it has made to the Liberal Party over the years. An appearance by Mr. Bosman at ICAC would help to clarify the mucky money trail that is called political donations in NSW. We look forward to ICAC's further investigations and findings in regard to 'allegations concerning soliciting, receiving and concealing payments'. TENKO MANAGEMENT PTY LIMITED formerly YERBURY FUNDRAISING EVENTS PTY LIMITED. Registered address is R M BOSMAN & Co, 83 Renwick Street, DRUMMOYNE NSW 2047. RODNEY MICHAEL BOSMAN has been director since 11 February 2000 and is now sole director & secretary – possibly also sole shareholder. I'd found the Yerbury name but the rest is 'new'. A bit of tilling keeps us off the streets - well, not exactly.